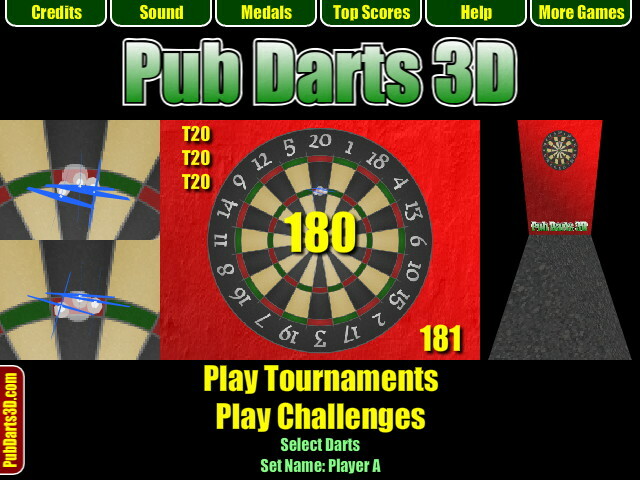 Hi, Pub Darts 3D is being finished off now, so please give us some feedback on how to improve the game. Let us know if you think the game is too hard or too easy, and let us know of any features you'd like to see. We're planning to make a facebook app with friends leaderboards and facebook achievements too. Play Darts Tournaments against the computer. Win the darts tournaments to unlock more cups and to improve your Pub Ranking. Play the Around The Clock challenge, Beat The Master & 21-Dart Challenge. Top score Leaderboards for all of the challenges and 501 darts cups. Compete against your friends to see who rules the board. Win over 30 Medals for top scores, 9-Dart Legs and other special achievements. Excellent 3D darts physics with multiple views. Use the hints that appears to quickly workout what score to aim for next. Accurate 501 Darts rules - with full bust and you must finish on a double or the bull to win each leg.